My art career originated in the graphic arts, but soon after, my attentions turned to the fine and decorative arts when I began accepting custom art commissions. Eventually, these commissions blossomed into a successful custom-painting business and through the years I have had the pleasure to design and execute countless murals and customized decorative faux finishes for hundreds of homes and businesses. I have always loved to accessorize, so recently I turned my attentions to designing and painting original jewelry, each an art-piece inspired by my love of the romance and charm of vintage art. I just love the rich, decorative art of the late Victorian era, the Pre-Raphaelite and Art Nouveau movements, which paved the way for the free-spirited Bohemian style we know today! 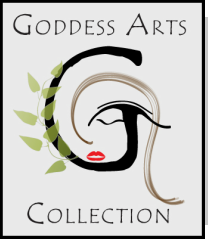 My goal is to create artful items that celebrate the beauty and grace that is in each and every one of us and offer them at comfortable prices..and so Goddess Arts Collection was born! You will find an artistic selection of individually hand-painted jewelry and accessories, art, and decorative pieces for the home, with most designs being one-of-a-kind pieces. Since many of my designs will either not be reproduced, or will be created in small runs, you will enjoy knowing you own an original work of art...a labor of love born in my studio! And my inspiration to create could strike at any time, so please check back to see my latest additions to my collection! I invite you to follow me on pinterest and to "like" my facebook page for access to my latest offerings!